Some more awesome tips from Calamity Wilde! 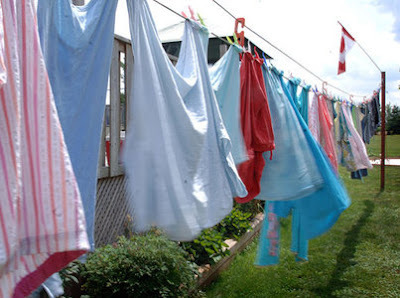 Hang your clothes to dry whenever possible. Save energy, and let your clothes soak up some fresh air. My Japanese friends NEVER use a dryer. They hang their clothes to dry indoors- always. Save water. 1) Don't leave the water running while you brush your teeth or the whole time you wash the dishes. 2) You don't have to wash that bath towel or that pair of jeans EVERY time you use them. My friend out in San Diego got me into trying to not wash clothes after one use, unless it's underwear, or you had a particularly sweaty day, of course. But you'll be surprised how much of a habit it is to throw clothes automatically into the hamper at the end of a day without considering how dirty they really are. It may be gross, but the rule in our house is "if it's yellow, let it mellow, if it's brown, flush it down." If you can save just one flush per day, you're saving a ton of water. Also, pee in the shower. The water's already running, so you won't have to flush.